Astrid is the exception. She has had a major refit and replacement of most of her systems. New Awlgrip hull, new Awlgrip decks, new nonskid, new teak decks, new cockpit seating, new cockpit table, new electronics, new custom dash, new A/V systems, new televisions, new canvas new enclosure, new soft goods, the engines recieved a major overhaul, new A/C units...the list just goes on and on. Incredible boat in wonderful condition. There is no sea state which will upset the 58 Eastbay, she can cruise at pace and comfort. One of the most astounding performing rides one can experience is at the helm of this tremendous owner operator yacht. 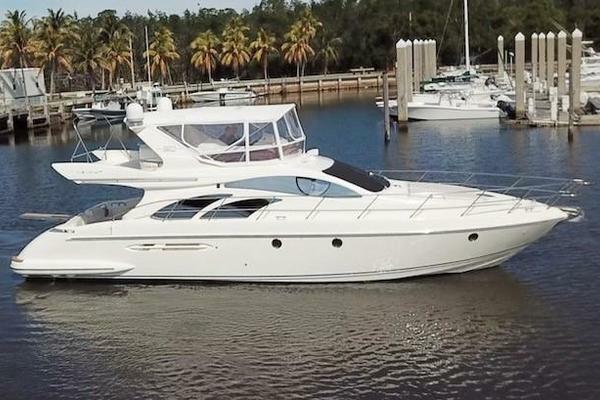 The Eastbay 58 Flybridge is a beast of a boat and Astrid is and exceptional example please come and see for yourself what an "open checkbook" approach to a full refit and ownership can do to make a boat a very special offering. Power, grace, and attitude to match: you're guaranteed to make an impression when making port in a Grand Banks 58 Eastbay FB. Equipped with the optional engine package boasting twin 1400-hp diesel engines powers the 58FB to over 30 knots. From the aft deck a stunning spiral staircase leads you safely to the fly-bridge while underway. Add in a long list of standard features, the proven C. Raymond Hunt deep-V hull design, and superb Grand Banks quality throughout the 58FB is sure to surpass the expectations of today's most discerning yachtsman. An immaculately maintained Eastbay 58 fly-bridge. 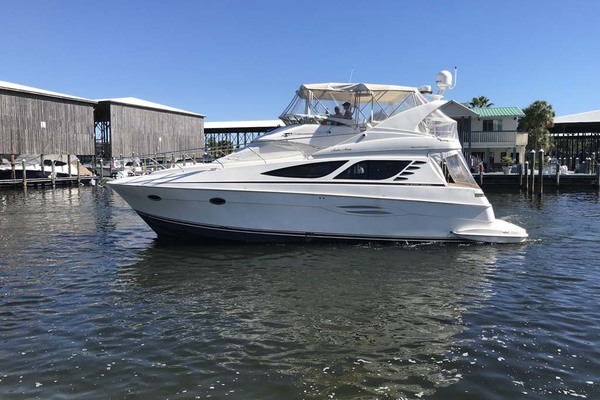 The 58FB represents the largest Eastbay built by Grand Banks, and is sought out by keen yachts- men and women looking for a solid, dependable fly bridge cruiser with classic down east lines. Stepping a board at the transom, you enter a large cockpit . Gorgeous teak sole and varnished teak trim provide a classic touch to her appearance. Storage lazarette space is accessed via the sole. To starboard, against the bulkhead, is a cabinet with an enclosed. A gently curving, molded-in stairwell with sturdy handrails provides safe access to the fly-bridge. The engine room is accessed via a large, water tight hatch. Access to the salon is granted via an over sized sliding glass door, delivering you into a large, airy salon. The salon is designed to accommodate owners and their guests in comfort and style two large settees and a club chair provide ample seating. A fold out, adjustable yacht table is easily changed to accommodate formal dining, cocktails or simply a night of card playing. For entertainment, a large flat screen TV (with satellite TV) is cleverly tucked away on a lift, aft of the port settee. The straight settee to starboard converts to an additional berth, when needed. Elegant draperies and shades provide privacy and comfort. The interior cabin soles are vanished teak and holly with custom fit Atlas carpet runners that accommodate the primary traffic throughout the boat. To starboard and forward, a Stidd helm seat anchors the helm station, where the Captain has access to a wide range of navigational electronics and aids (see "electronics"), as well as starboard door deck access. Four steps down from the salon, the U shaped galley is located to port- bright and airy, the galley is "open" to the salon and receives quite a bit of natural light from the main deck windows, as well as excellent ventilation from the opening porthole. The galley is well turned out, with granite counter tops a dual basin stainless steel sink, twin Glacier Marine cold plate units (one freezer, two refrigerators), Miele electric cook-top, GE Advantium microwave oven and KitchenAid trash compactor. To starboard of the galley is a fantastic room that can be used as an additional stateroom with larger queen against the hull. Moving forward through the companion way, a guest stateroom with two bunks is located to port. This cheerful room features two side by side singles, a large closet and plenty of storage under the berths. Across the companionway is a guest head with a stall shower, toilet and vanity. Forward of the guest accommodations, the master stateroom is large and very well appointed, featuring a large, center-line island queen berth, hanging lockers, bureau storage drawers and private en-suite head access. Natural light is plentiful, via over head hatches. Very preliminary information only at this time.